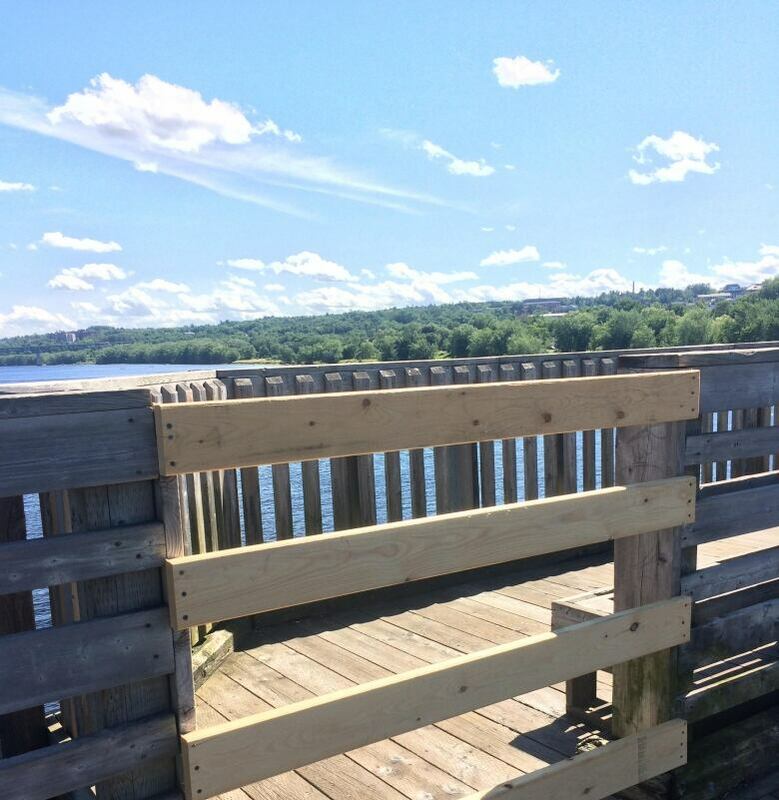 Viewing platforms on Fredericton's Bill Thorpe Walking Bridge will be closed indefinitely because the railings are rotting, a city spokesperson says. Viewing platforms on Fredericton's Bill Thorpe Walking Bridge will remain closed indefinitely, a city spokesperson says. The platforms closed in July after the City of Fredericton's parks and trees division noted some rot on the railings. A loose railing on one of the lookout platforms was also discovered. "They discovered there was rot not just in the railings but in the decks and the beams that make up the overlooks themselves," said Wayne Knorr, a spokesperson for the city. The 79-year-old former railway bridge connects the south and north sides of the city, and the platforms offer people a chance to sit on benches as they look out over the St. John River. An engineering firm that was called in to look at the viewing platforms said in a report that they were designed to support a certain weight, which would have been compromised by the deterioration. "The actual walking deck remains safe," Knorr said. "It's a different kind of engineering system that holds that deck in place. "But because the beams cantilver out off the side of the main bridge structure, they're exposed to the elements in a different way and they have simply overtime rotted and worn." Knorr said the city's parks and trees division inspects the bridge daily. Any crack or rotted board is noted and replaced. A decision still hasn't been made about the platforms' future, or about the deck of the overall walking bridge. "The full decking of the bridge is in need of a full rebuild due to the old railway ties that are underneath the current decking. They are rotting away," Greg McCann, a project engineer with the City of Fredericton said in an earlier interview. In an interview with Information Morning Fredericton, Knorr said the bridge is owned by the province, which has been in talks with the city about future repairs. City officials have also applied for funding from other levels of government to help cover the reconstruction costs, and they are waiting to hear back. A spokesperson for the province said the government knows the bridge is important to Fredericton residents and tourism and is working on the financing for rehabilitation work. "Getting this work done is a priority of the provincial government," said communications official Anne Bull. Knorr, too, emphasized the bridge's value to the city. "We know it is a well-used resource," he said. "It is not simply a recreational resource. It is an active transportation resource."